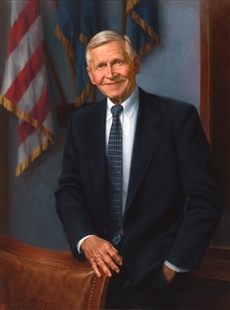 It is uncommon, but not unheard of, for a Member to have more than one portrait in the House of Representatives. 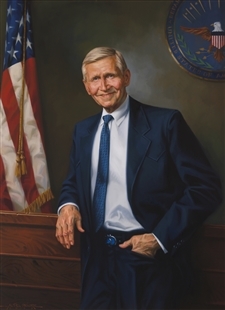 This painting, marking Stump’s leadership of the Armed Services Committee, is one of two depicting Stump as a committee Chairman. Both show the subject in a similar pose, leaning to one side, left hand in pocket. Also present in the two paintings are the same turquoise-and-silver belt buckle, a reminder of Stump’s western origins.